Strong, lightweight and economical, Easy-Curve can be bent into irregular "S" curves or rolled into columns as small as 6" in diameter. 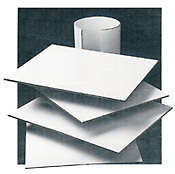 Strong and rigid, yet flexible, this paperboard product is ideal for a wide range of applications. Features a smooth, 2-sided white surface and is available in standard 4' x 8' sections with three nominal thicknesses: 3/16", 1/4" and 3/8". A general-purpose panel with a smooth, off-white finish on both sides. Part of the Upsonite general-purpose product line, Universal is ideal for indoor displays and handles most paints easily. Available in standard size 4' x 8' and two nominal thicknesses: .075" and 3/16". A strong, weather-resistant, all-purpose fiberboard. Available in widths of 4' and 8' and lengths up to 32'. All-Weather features four nominal thicknesses: .125", .187", .250", and .350".